If you were to ask me how I am, right now, and I were to give you an honest answer, what you'd get is something like 'augh ... busy ... work ... you know ... ' with accompanying facial expressions and arm-waving. I don't talk about my job much because it is politically sensitive, most of it is boring to people who aren't in the trade, and anyway, I write here because I want to write about things other than agriculture sometimes. Lately one of the very high priority things on my desk has transformed into Dr Goodhair's Crazy Deadline Show and eaten all of my time and most of my energy for most of the last month. The other high priority things on my desk are Project Hydra and the sequel to The Giant Ball of Stress, Dances with Balrogs. Expect them to eat my life once I've dispatched Dr Goodhair's crazy deadlines. The only way I can cope at all with this is to spend my weekends gardening furiously. I have to get out of my head, and sitting at my desk writing blog posts does not get me out of my head. Going outside with the dog and yanking weeds, however, is very effective, and has the bonus of tiring me out physically. I do not sleep well when I'm in my own head stressing out about crazy deadlines. I do sleep well when I've been pulling weeds and digging holes in the ground. So, how am I? I'm OK. I'm working really hard on some very challenging projects, but the garden is keeping me sane. All of the above does mean the the Belfry collects some dust, and let's face it, weeding is not the most interesting subject, so it's not like I come up with a lot of new material while I'm out there. The garden looks pretty nice, though. So much of gardening is about maintenance, and I have been doing the maintenance. This weekend I treated myself to annuals in addition to weeding. I have a couple of window boxes on the deck, and a couple of new baskets on the fence in front. 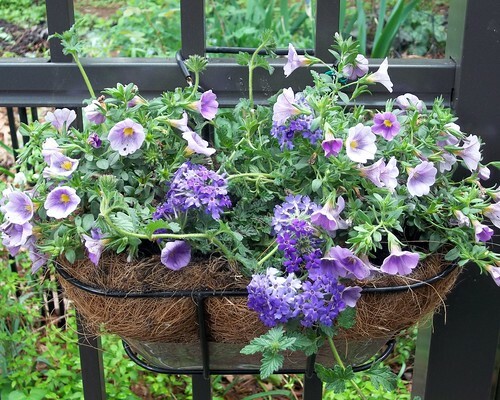 Therefore no flower baskets on the mailbox, but a little creative wirework hangs them on either side of my gate (safely distant from the mailbox), where they can be filled with pretty annuals. This summer, it's calibrachoa and verbena. Calibrachoa are relatives of petunias, and like their cousins are mostly native to South America. 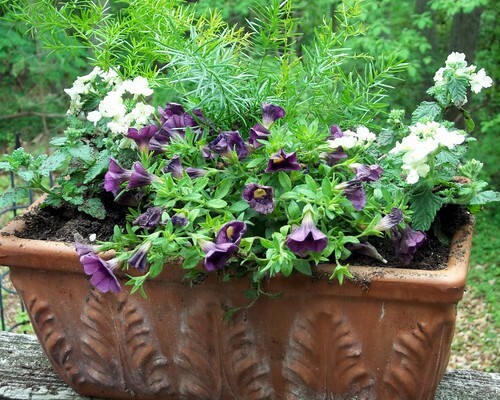 They also share a fondness for hot, sunny conditions and a tolerance for drought, so they're excellent container plants. They are newer than petunias to the garden centres around here, but they're becoming very popular. Verbena, for their part, are mostly native to North America, but also like hot, sunny conditions and tolerate drought well. They come in nearly every colour you could want, bloom vigourously, and are sweetly fragrant. They are also, as you might imagine, very popular container plants. Not a daring combination, perhaps, but pretty, and likely to stay so through the summer.